More than 500,000 people suffered from workplace stress last year, costing businesses 12.5 million working days, according to the Health and Safety Executive. So how can leaders improve their emotional literacy and demonstrate it’s safe to talk about mental health at work? Ruth Sutherland, CEO of Samaritans explains. Why do you think our workplaces are becoming more stressful? Research has shown that heavy workloads, tight deadlines and a lack of managerial support are the main factors causing work-related stress, anxiety and depression. Our work is a big part of our identity and we spend most of our time in the workplace. If we feel overwhelmed and stressed at work, it has a detrimental effect on other parts of our lives including our relationships and physical health. Employees who have felt overwhelmed at work say they didn’t want to let anyone down, or they didn’t want to be a seen as a poor performer. They don’t tell anyone and carry on until they reach crisis point. We all have a responsibility to support our colleagues and employees, to look out for them and to offer help when needed. Employers can support their staff by giving them the tools and training to manage their emotional wellbeing. Fostering a healthy work-life balance through flexible, home, or part-time working, can also make a big difference to employees’ wellbeing. Alastair Campbell has previously told us that there is ‘nothing brave’ about talking about your mental health – that we should view mental ill health the same we view asthma. Mental health and suicide are being discussed more openly in the workplace, but stigma still exists. 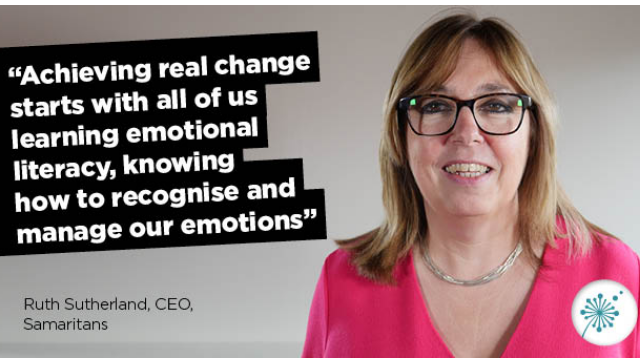 The only way we can bring about real change is to create open and supportive workplaces, where staff feel able to talk about their emotional health without fear of judgment. Making a public commitment to prioritise staff wellbeing is a good place to start. Hearing senior leadership openly discuss mental wellbeing sends a clear message to staff that it’s okay to ask for help. Everyone can be overwhelmed at times, anyone can have suicidal thoughts, everyone can help. Achieving real change starts with all of us learning emotional literacy, knowing how to recognise and manage emotions. This is as important as learning to read and write, and the earlier in life we start the better. Why do you think so many employers are scared to talk about mental health? It can be daunting stepping in and talking to colleagues about mental or emotional health. We worry that we might say the wrong thing or make things worse. But you don’t need to be a mental health expert to help someone who is struggling. Just asking a colleague who appears to be in distress ‘are you okay?’ can make a big difference. Often people just want to know someone cares. What role does the Samaritans play in supporting businesses? Samaritans’ wellbeing resources and workplace training gives staff the confidence to manage difficult conversations with people who are struggling and the tools to look after their own mental wellbeing. We want to create happier and healthier workplaces. We believe this starts by creating open and supportive working environments, where people feel listened to. Listening can be incredibly powerful. There’s a difference between hearing and actively listening. For those struggling, it can provide a lifeline, avert a crisis and turn lives around. One of the reasons Samaritans created Wellbeing in the City was to bring listening skills into the workplace. How does Wellbeing in the City work? Wellbeing in the City is an online learning tool, developed with the Lord Mayor’s Appeal, which gives employees the skills to intervene when someone is struggling, actively listen and manage difficult conversations. It also helps staff manage their own mental wellbeing. Since its launch in April 2018, thousands of people have signed-up. Bank of England, KPMG and PwC have rolled out the tool companywide and we’re delighted to see it having such a big impact. Ben Higgin, a partner at PwC, told us: “Before the training, over 70% of our people said they’d experienced a situation where they’d had to approach the subject of mental health. Wellbeing in the City gave 92% of those people more confidence to identify the signs of someone in distress. How is our ‘always on’ culture affecting our health? Encouraging staff to develop a healthy work-life balance can only be a good thing. Technology allows many of us to work anytime and anywhere. This gives us the flexibility to fit work around other commitments, but we can find it hard to switch off. This inability to switch off exposes people to feeling overwhelmed and unable to cope. Employees should be encouraged to disconnect from work and communicate their personal boundaries to their employer. What advice would you give to a business leader when discussing mental wellbeing with their employees? Promoting employee wellbeing should be a key part of any organisation. You can start by raising awareness among senior management. Bringing together staff members with an interest in mental wellbeing and creating a Mental Health Network can also be effective. Provide training and resources, so staff can respond and offer the appropriate support when someone is struggling. And make sure all of this is well publicised to staff.